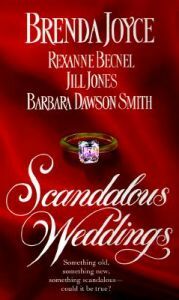 You're invited to four unforgettable weddings -- each with a scandal that would make a bride blush! In this delightfully wicked collection, four bestselling authors depict weddings at their most scandolous -- and tying the knot has never been so outrageous. Steamy, sensuous, and more delicious than a piece of wedding cake, "Scandolous Weddings" is the romantic event of the season!